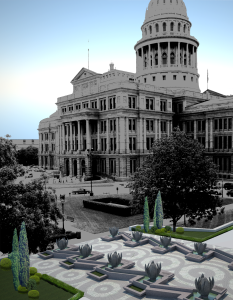 The Bill of Rights Plaza, which re-imagines the current plaza in front of the Texas Supreme Court building and directly adjacent to the historic Texas State Capitol, promises to become a national destination monument to the Bill of Rights. MyBillofRights.org has now received approval to release designs and begin fundraising. Lead designer (and Texas native) Holly Kincannon’s elegant re-design of the existing space is both compelling and dignified, providing an environment where each individual amendment can be reflected on, and the sum of these remarkable parts celebrated. This achievement is the product of years of hard work, beginning early in 2007, when Reps. Mark Strama (D-Austin) and Joe Straus (R-San Antonio), along with co-authors Reps. Phil King (R-Weatherford) and Elliot Naishtat (D-Austin) introduced HCR 111. The resolution was approved with broad bipartisan support, and signed into law by Texas Governor Rick Perry on June 18, 2007. After 18 months of design development and stakeholders meetings, MyBillofRights.org has now received all necessary approvals to begin fundraising. We are currently putting together a Texas-based Executive Committee to raise the necessary funds, which our pricing package (prepared by award-winning contractor Spaw Glass estimates at $4.1 million. To date, MyBillofRights.org has already raised and expended over $120,000 for Project Development for this effort, from over 1000 contributors in 40+ states and the District of Columbia. Because the scope and status of the Bill of Rights Plaza project give it national importance, MyBillofRights.org will continue its nationwide outreach alongside our Texas-based efforts, as we at long last honor the Bill of Rights in a manner appropriate to the importance of this brilliant American charter. You can join us in this effort by making your dedicated contribution now, or contact us at fundraiser@MyBillofRights.org for more information on how to arrange a full project presentation for your group or organization.